Welcome to the Microelectronics Design Lab in in the School of Electrical and Electronic Engineering, The University of Manchester. The lab is led by Professor Piotr Dudek. Our research focuses on VLSI circuits and systems, especially vision sensors, cellular processor arrays, analogue and mixed-mode signal processing, brain-inspired systems and chip design for biomedical electronics. Below is a brief overview of major research areas. Please see our Projects page for more details on our research activities, and Chip Gallery for some additional information on current/past projects. For a more in-depth information on our work, please see our Publications. 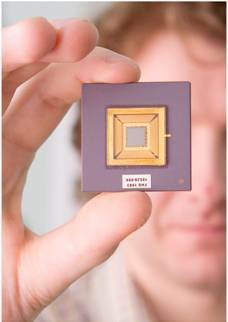 Vision chips are microelectronic devices, which combine image sensing and processing on a single silicon die. 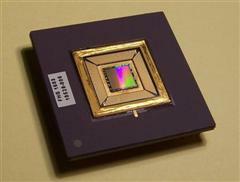 In a way somewhat resembling the vertebrate retina, these semiconductor chips perform preliminary image processing directly on the sensory plane. They can be used for computer vision applications in areas such as autonomous vehicle guidance, robotics, industrial inspection or surveillance. We investigate the design of vision chips, using CMOS technologies. Integrating a processing element (PE) within each pixel of the image sensor array results in thousands of processors working concurrently, which enables the processing speeds of billions of operations per second to be easily achieved, at very low power consumption. Cellular processors arrays offer high computing performance and are ideally suited to perform pixel-parallel image processing tasks. Our research focuses on computer architectures based on fine-grain SIMD processor arrays and asynchronous cellular automata. We have developed several approaches, e.g. SCAMP is family of mixed-mode pixel-per-processor SIMD array devices while ASPA devices are massively parallel processor arrays which work in asynchronous/synchronous mode running wave-propagating algorithms. We implement integrated circuits in state-of the-art and emerging silicon technologies, such as sub-100nm CMOS and stacked 3D wafers. Brain-inspired VLSI circuits may one day replace conventional microprocessors as more robust and intelligent systems. They will be also used as controllers for autonomous robots, and in prosthetic devices. 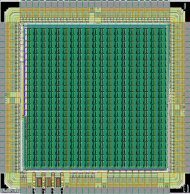 We research digital FPGA based, and analogue full-custom VLSI based acceleration engines for neural computation. Currently we participate in two collaborative projects, REVERB and COLAMN, supported under the EPSRC Novel Computation Initiative, where we work with neuroscientists, psychologists and computer scientists, investigating computation in biological neural networks and designing neuromorphic chips and systems implementing natural computation in hardware. Analogue signal processing circuits can offer higher efficiency (in terms of performance, silicon area and power dissipation) than their digital counterparts. We investigate algorithmically programmable general-purpose analogue microprocessors build using switched-current circuit techniques and analogue implementations of spiking neural networks. We are interested in ultra-low power computing hardware. We are also developing sensors, sensor interface circuits and signal processing circuits for biomedical applications, such as high-frequency medical ultrasound systems.